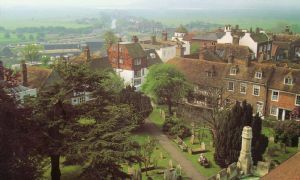 For more than 900 years the Parish Church of Rye, dedicated to St Mary the Virgin, has dominated the hill on which the old town stands. When the building of the present church was started, early in the 12th century, the town itself and much of the surrounding area was still held, under a Royal deed of gift, by the Abbey of Fecamp in Normandy. It is because of this link with Fecamp and the fact that it had become an important member of the Cinque Ports Confederation that Rye has such a magnificent church, which has sometimes been called 'the Cathedral of East Sussex'. The worst disaster in the church's history occurred in 1377 when the town was looted and set on fire by French invaders and the church was extensively damaged. 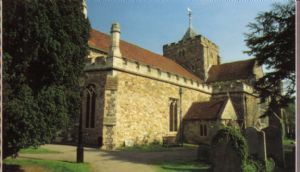 The roof fell in and the church bells were carried off to France.They were recovered the next year when men from Rye and Winchelsea sailed to Normandy, set fire to two towns and recovered much of the loot, including the church bells - one of which was subsequently hung in Watchbell Street, to give warning of any future attack. It was not returned to the church until early in the 16th century. 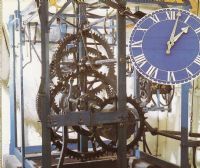 The 'new' clock was installed in about 1561-2 and was made by the Huguenot Lewys Billiard. It is one of the oldest church turret clocks in the country still functioning. The pendulum, a much later addition, swings in the body of the church. The present exterior clockface and the original 'Quarter Boys' (so called because they strike the quarters but not the hours) were added in 1760. Today, if you wish, you can climb the church tower where you will see the 8 bells now hanging there. These are not the same bells that were stolen in 1377 as they were re-cast in 1775 and new bells added. 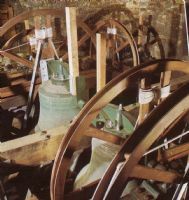 The total weight of the 8 bells and clappers is almost 5 tons. St Mary's is open to visitors every day of the year, except for Christmas Day, from 9.15am - 5.15pm in summer and 9.15am - 4.15pm in winter. The Visitor Centre stocks a good range of postcards, Christian greetings cards, prayer cards, books, gifts and Christian jewellery. The Tower, which is open every day (weather permitting) for a charge, has become a popular place for marriage proposals!